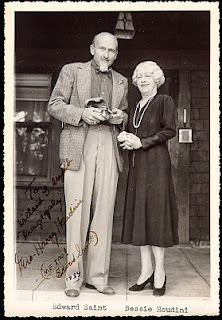 WILD ABOUT HARRY: Marie Hinson on Edward Saint: "He was the man who said 'no'." Specifically, Bess & Saint met at Rye Beach's "Playland Amusement Park". I went there every Summer as a kid, and later worked there. The park has been in operation since the 1920's, and is still going strong. Thanks Joe. Good to know the location. Did they meet in 1930? Just read where they/she said Saint was Feathering his nest with Bess Houdini's money?? ?